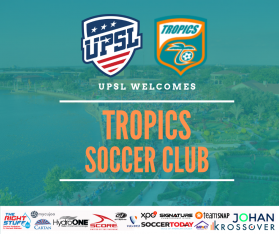 LOS ANGELES - Feb. 7, 2019 - PRLog -- The United Premier Soccer League (UPSL) is pleased to announce Tropics SC as a new league member kicking off with the 2019 Spring Season. Based in Lakeland (Fla.), Tropics SC will begin play in the UPSL Pro Premier Florida Central Division and host its home games at Lake Myrtle Sports Complex (2701 Lake Myrtle Park Rd., Auburndale, FL 33823) in compliance with UPSL Minimum Standards. United Premier Soccer League Florida Division Manager Christian Vallejos said, "The UPSL Florida Central Division continues to attract strong clubs with quality teams at all levels, and we are pleased to welcome Tropics SC and their ownership group, led by Dr. Panos Iakovidis, to the league for the 2019 Spring Season." Florida Tropics SC, the teams' overseeing Club, is a professional soccer organization featuring teams in Major Arena Soccer League (MASL), United Soccer League (USL) League Two and the Women's Professional Soccer League (WPSL). The Club also has three youth clubs in Lakeland (Fla.), Pinellas County (Fla.), and Celebration (Fla.). Tropics SC Majority Owner and CEO Dr. Panagiotis Iakovidis said, "This move simply allows us to use all the players under our Tropics umbrella and continue to develop together, year-round. The UPSL is a little less restrictive when it comes to eligibility, so in the long run, this will help the Tropics franchise become stronger and even more competitive than we have ever been." Tropics SC General Manager and Vice President of Business Operations Andrew Ross said, "Joining the UPSL allows us to continue to grow the development side of our organization and set us up to be successful at the professional level of the outdoor game. We feel the UPSL is a perfect stepping stone for some of our younger players and a good opportunity to trial new players who may fit well into our system. It is also a good fit for some of our indoor players who want to train and play year-round but are not the right fit for our USL League Two team due to the age and international restrictions." The club will host the first round of open tryouts at Lake Parker Park (910 Granada St., Lakeland, FL 33801) on Feb. 23. Florida Tropics Soccer Club is a professional soccer organization based in Lakeland, Florida. The Tropics operate a Major Arena Soccer League Franchise (Florida Tropics SC who play at the RPFunding Center in Lakeland), a USL League Two franchise (Lakeland Tropics who play at historic Bryant Stadium in Lakeland), a WPSL franchise (Florida Tropics SC Women's) and the Kickers FC, one of the premier amateur club programs in the United State with seven national championships. The Tropics youth club umbrella includes Lakeland Tropics FC, Pinellas County United Tropics, and the Celebration Tropics. The Tropics are owned and operated by Central Florida Sports Ventures, LLC, headquartered in Lakeland, Florida. More information can be found at www.TropicsSoccer.com.